But, before you can take the train you first need to make your way from Khao San Road to the Phaya Thai Skytrain Station. Since Khao San Road is located in the Old City and is not connected to the city’s train network you are left with few options. It is about 5.5KM, so on foot you’d have to hoof it for about an hour. With luggage and all, that should be reserved only for the elite urban mercenaries of budget backpacking hell bent on saving a satang everywhere they can. For the rest of us with our wits about us, we will opt for a vehicle of sorts. The cheapest option is Bus #503 leaving from Kong Salak bus stop on Ratchadamnoen Road. Look out for the red bus as it costs no more than 8 baht. Catch the yellow bus that is air conditioned for about 12 baht, or the orange air conditioned bus for around 18 baht. Each of these buses should operate with some consistency, however be aware that waiting on a certain color of bus #503 could cause significant delays to your journey. An alternative is to grab a taxi. 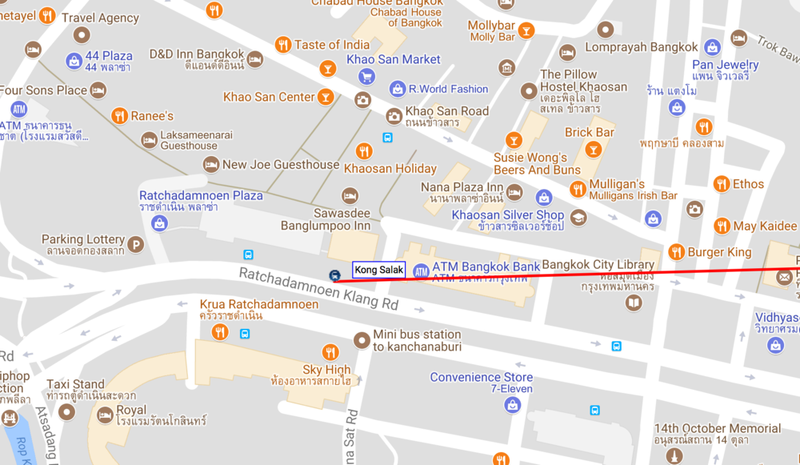 A metered taxi is difficult to find around Khao San Road itself, so try walking over to the main road of Ratchadamnoen to flag a taxi driving by. These taxis will be more likely to use the meter. A metered taxi starts at 35 baht and goes up about 6 baht per kilometer. Your journey from Khao San Road to Phaya Thai Airport Rail Link Station shouldn’t exceed 75 baht with smooth traffic. If you are unable to find a metered taxi to take you, try your luck with convincing the nearby tuk tuk drivers or taxi drivers to ride you at a flat fee not more than 100 baht. A motorbike taxi should take you for 60 or 70 baht. Bangkok is a huge city that suffers from urban sprawl, although, you don’t need to suffer when you travel around Bangkok. There are plenty of options to choose from when you need to travel from point A to point B in Bangkok. Knowing which is the best choice for you is essential to saving time, money or your sanity. Chatuchak Weekend Market is Thailand’s largest outdoor markets and an iconic attraction in Bangkok. It should be on the list of things to do in Bangkok of any avid shopper, or visitor who is looking to see a truly unique place. With over 15,000 stalls on 27 acres of land, Chatuchak is enormous and a place that many would attest, you could find just about anything in the world here. From antiques to pets, paintings to T-shirts and a whole bunch of food and drinks, Chatuchak Weekend Market is a great place to pick up some souvenirs, home furnishings or little furry friends. Benjakitti Park is located in the heart of the city, not far from the main interchange of the BTS and MRT rail systems. You can access the park easily from either BTS Asok, MRT Sukhumvit or MRT Queen Sirkit Convention Center. The park boasts and large interior lake with a 2 kilometer track that has separate cycling and running paths. Thought of as the most beautiful park in the city it definitely fulfills its intended purpose of making Bangkok a more livable city. Lumpini Park is one of Bangkok’s best retreats from the city’s scorching heat. Sitting on 142 acres of land complete with a large lake, 2.5 KM track, fitness facilities and plenty of lush vegetation, it is a must visit for any tourist or local. Bangkok has a reputation as one of the best cities for its nightlife. The nightlife in Bangkok is lively due to the various options available for drinking and partying. Bangkok is home to some top-notch nightclubs that would rival those in any other large city, bars that are designed by world-class bar designers, dive bars and pool bars to grab a cheap beer and a quick game of pool or a game on TV. Perhaps the most notorious aspects of Bangkok nightlife are go-go bars. One of the most well-known areas for go-go bars is Soi Cowboy. Travelling Thailand is mostly easy. Getting from Bangkok to Phuket is also pretty simply as there are plenty of options. The way you choose to make the journey will be very dependent on your budget, since there is every imaginable way to choose from. Planes, trains and automobiles will all get you there, perhaps not safely, but hopefully you’d make it intact. In general, Bangkok is a great city for shopping since you can find so many different types of places to do it at. Bangkok is also known for its amazing nightlife. What is more, Thailand has an amazing culture. Visiting a local night market while you travel in Bangkok is a great way to get to experience all three of these incredible features of the city.